Have you ever glimpsed the inner corners of an artist’s studio? Seen the space where all those meandering thoughts unfurl, coalesce and solidify into something tangible? It’s almost like an act of alchemy, with the artist, whatever their medium, acting as the alchemist. 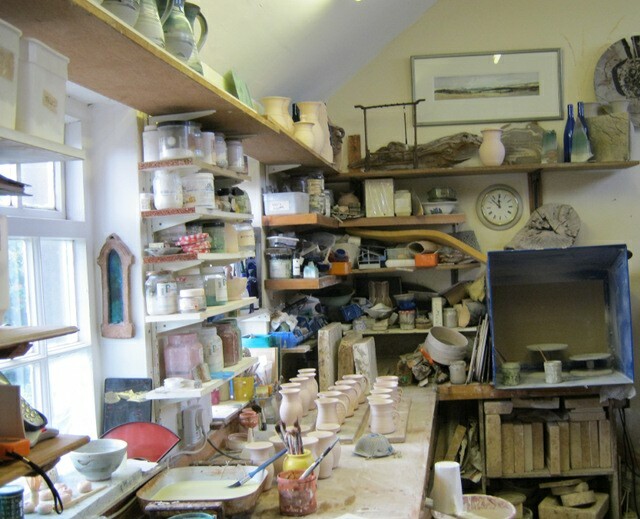 In a curious way, peering into that studio is akin to peeking into the artist’s mind – the things they surround themselves with are all important prompts, tools and workings of the artist’s craft. And the unfinished or discarded works of art are the most intriguing clues of all. Use this as your starting point, then either write a piece about the artist themselves and their nature (isolated, gregarious, grumpy or serene), or pick on one item spotted in their studio, and follow the ideas sparked by that. Better still, weave the two together in your own act of alchemy. If this idea prompts you to write something, I’d love to know. Just send an email to Judy(at)socket creative.com. You could end up published on SkyLightRain.com. You can see how my own piece of writing unfurled in response to this idea in the story Pressed Leaves, in issue 18 of The Simple Things.